The health ministry conditionally approved Tuesday the world’s first clinical study to treat patients with corneal disease by using induced pluripotent stem (iPS) cells. The study, to be conducted by a team of researchers from Osaka University, will be the sixth time the government has authorized clinical studies using iPS cells. The team will transplant 0.05-mm-thick layers of corneal tissue produced from iPS cells into four adult patient s who suffer from a disease that causes corneal haze and decreased vision. 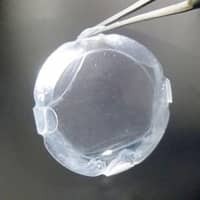 The patients will each receive a transplant of some 3 million to 4 million corneal cells, which is almost the same amount of corneal cells that are in the eyes of healthy people. The transplanted cells are expected to keep making more corneal cells, and so contribute to the recovery of sight. The first transplant operation will be conducted as early as June, according to the team. The disease, called corneal epithelial stem cell deficiency, is caused by losing cells in the eye that produce the cornea due to illness or injury. Safe and effective medical treatments have yet to be established for the condition. A total of 1,600 patients are waiting for corneal donations in Japan, according to an estimate by the ministry. The treatment being developed by the team at Osaka University may become a new option for such patients. Conventional corneal transplant operations are prone to rejection because immune cells get implanted along with the rest of the cornea. The sheets of corneal cells to be used in the study do not contain immune cells, so the team believes that they are unlikely to trigger rejection reactions. A ministry committee has said it will require the team to provide more detailed documents explaining the clinical study to the patients before it can proceed. If the study is successful, the team will aim to start clinical trials and to secure state approval for the manufacture and sale of regenerative medical products using the technology within five or six years. Induced pluripotent stem cells, which can grow into any type of body tissue, were identified by Kyoto University’s Shinya Yamanaka, who won the 2012 Nobel Prize in physiology or medicine for his work. The world’s first clinical study using iPS cells was conducted in 2014 by the government-backed Riken institute, transplanting retina cells into a woman with age-related macular degeneration. The other four studies have tackled Parkinson’s disease, heart disease, platelet transfusions and damage to spinal cords.